Preparing food is not an easy job. Unless you do not have the right tools for your kitchen, it's very difficult to prepare the food. 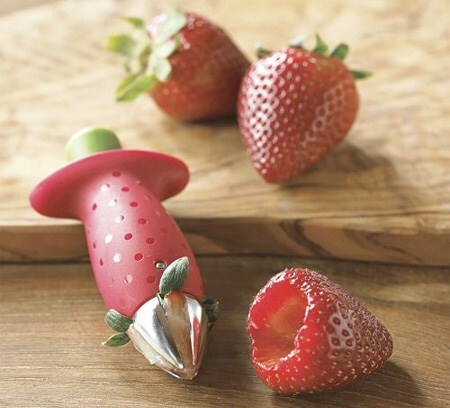 So, to help you out, we have a collection of unusual kitchen gadgets and creative product designs that will help you prepare food faster and with less effort. 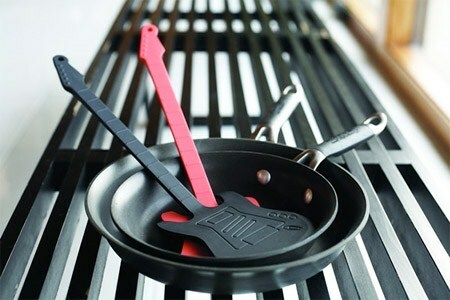 These tools will improve your cooking process and make the cooking experience more enjoyable. 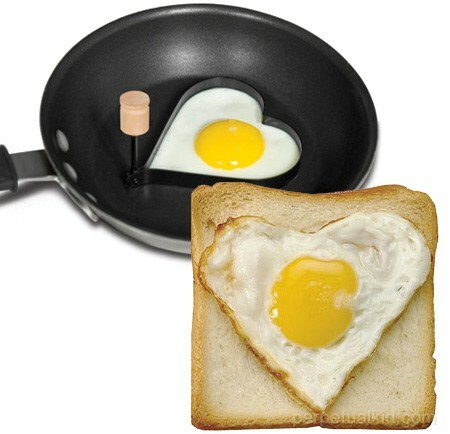 What says “I love you” more than a heart shaped egg? Drop some stone-cold fangs into your Bloody Mary and feel that chill go right down your spine. 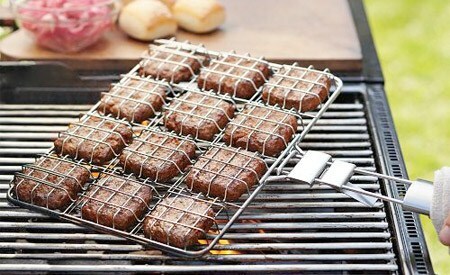 Perfect for family barbecues, this grilling basket can hold 12 burgers. 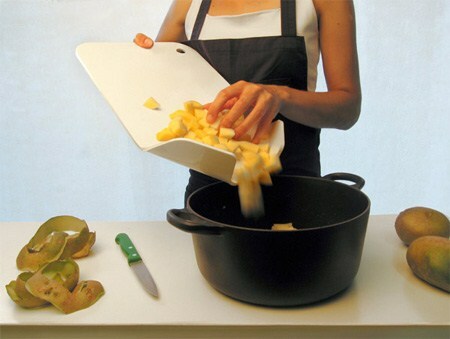 Removes leaves and stems while leaving as much fruit as possible. 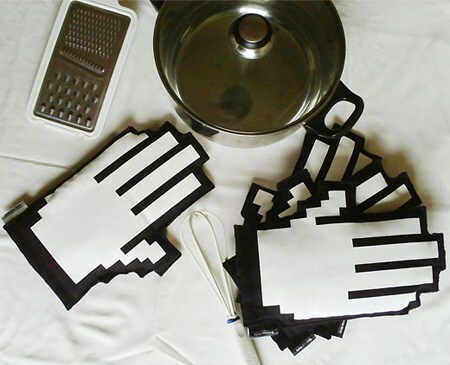 Designed by Anderson Horta, these creative oven mitts were inspired by the hand cursor from your computer. 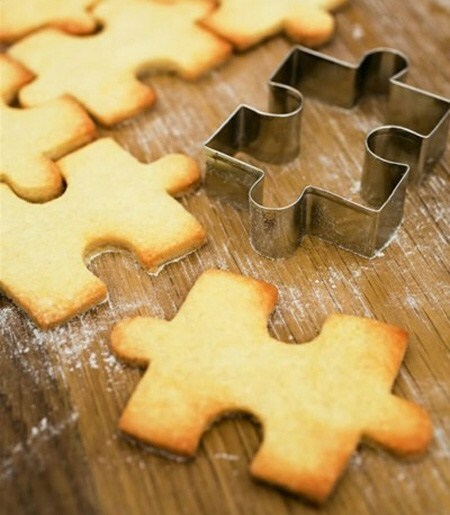 Clever bakeware product. 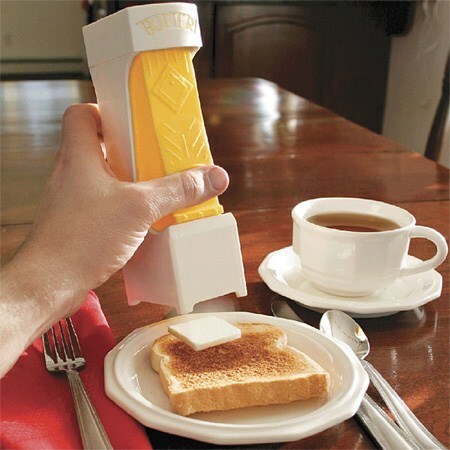 This ingenious butter cutter delivers one standard pat with each click of the handle. No more messy butter dish. 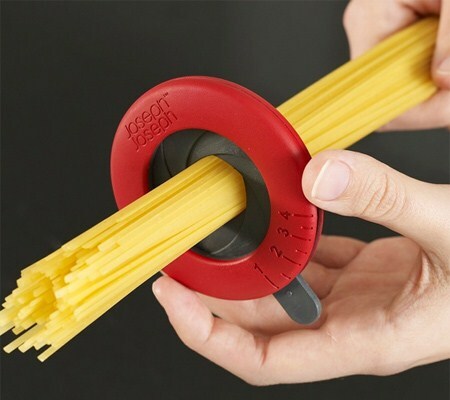 Useful kitchen tool for measuring out pasta for 1 to 4 servings. 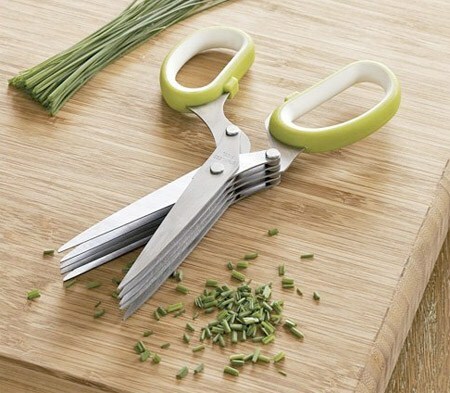 The unusual blade design features a set of five sharp blades that allow you to cut, chop, or mince your favorite herbs. Hedgehog inspired cheese grater will look great in your kitchen. 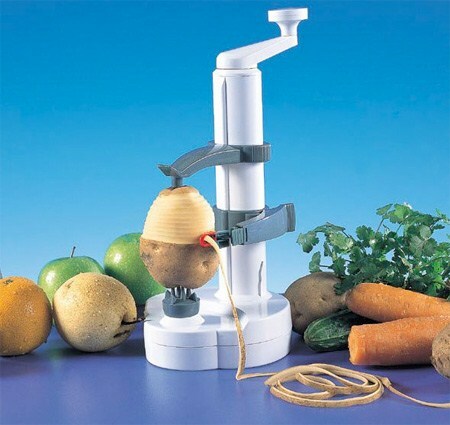 Take the drudgery out of peeling potatoes with this cool invention. 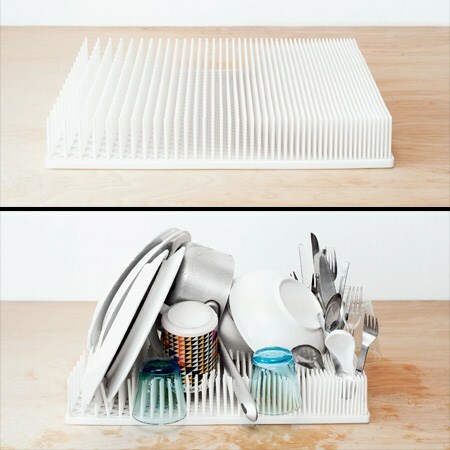 Dense concentration of rods is useful for holding cutlery, glassware, bowls, plates and pans. 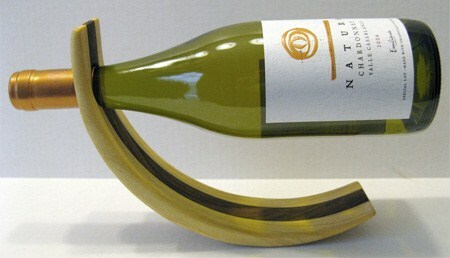 Self balancing wine bottle holder that you can rock with a little push. Carving board designed by Ernest Perera. The channel in the middle makes sure that nothing falls out of the frying pan. 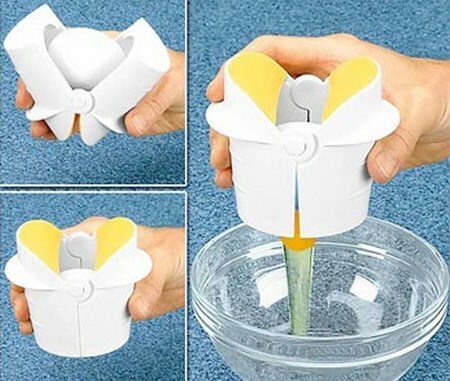 Little ones will love helping out in the kitchen with this creative, metal, jigsaw piece cutter. In 1938, the Wheel of Death introduced a spinning target! 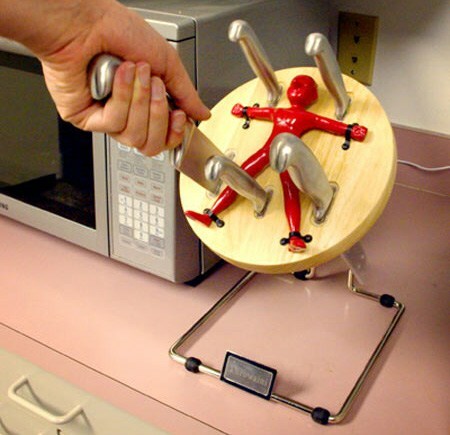 Decades later, knife throwing still lives on in the modern day circus and it can live on in your kitchen with the Throwzini’s Knife Block. 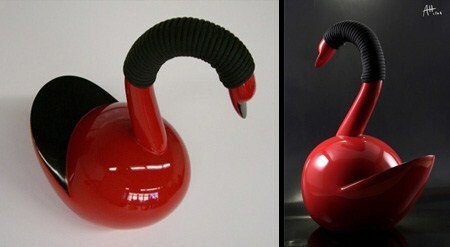 Creative teapot design by Adam Hammerman is shaped like a bird. This manhole-inspired silicone work-horse will stop the water’s flow when you need a full sink. 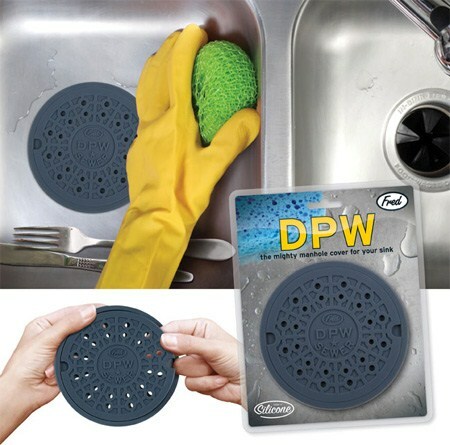 Give it a simple twist to line up the drain holes and it turns into a highly-efficient strainer. 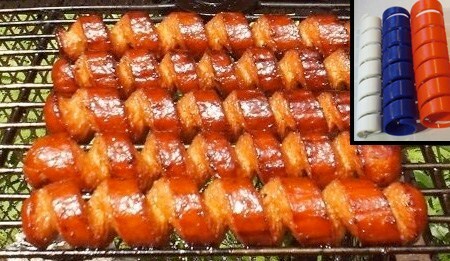 All the dexterity of using your fingers with none of the hideous burns. 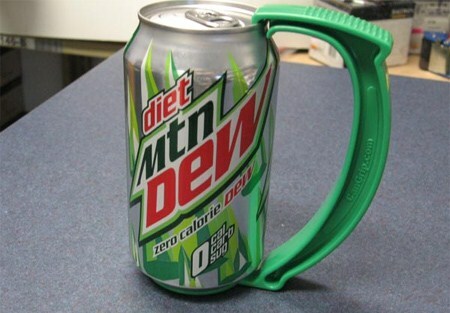 Reusable plastic handle that snaps onto any standard can. 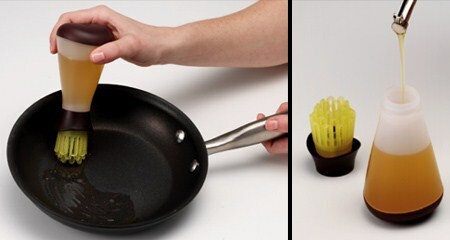 Heat-resistant brush allows you to apply cooking oil with no mess. 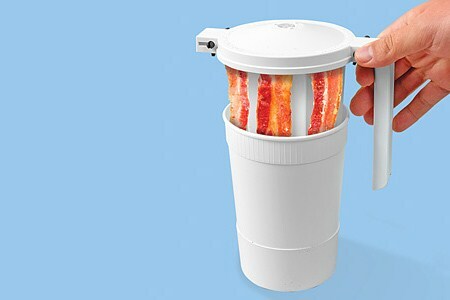 This compact and enclosed unit collects drippings for easy disposal while minimizing bacon smell inside the microwave and in the kitchen. 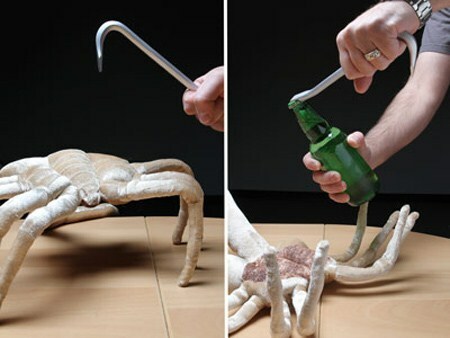 Perfect for all your zombie killing and beverage drinking needs. 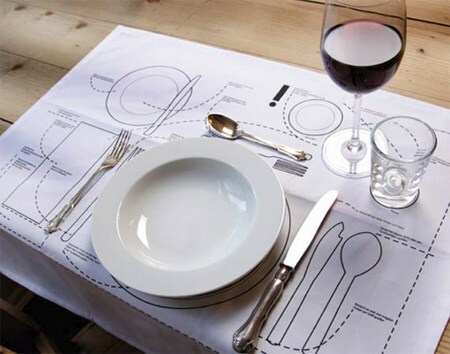 Creative placemat teaches you how to set a table with tableware. 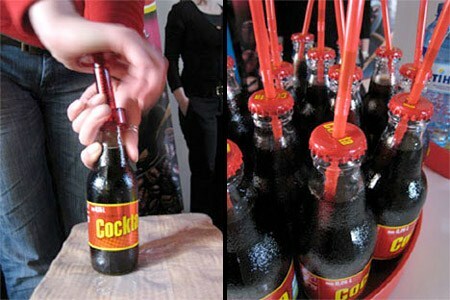 Use the BottleBob device to pierce a perfectly-sized round hole in any soda or beer bottle cap, and enjoy your drink through a straw. 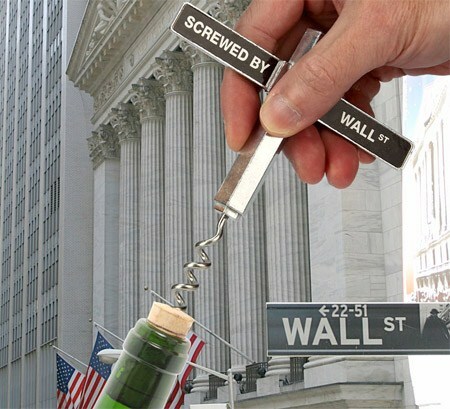 Open wine bottles in style with Screwed by Wall Street corkscrew. 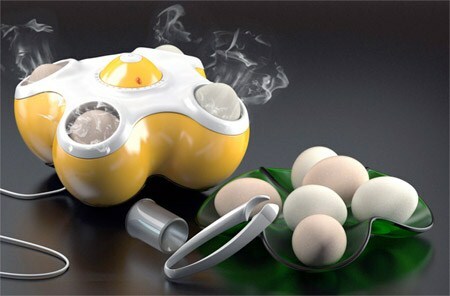 Bang Bang egg steamer works just like a regular pop-up toaster. 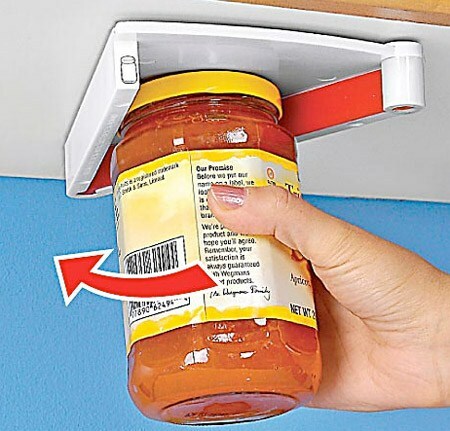 Magic Twist jar opener simply mounts under any kitchen cabinet. 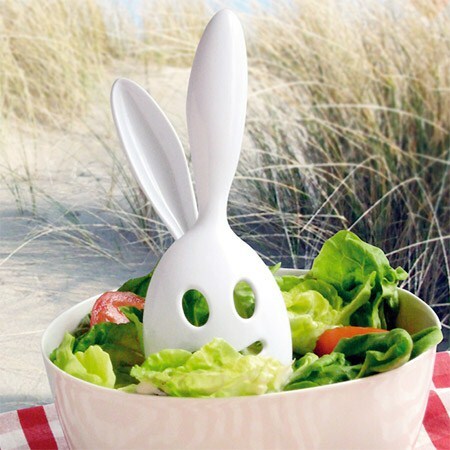 This cute Bunny loves a good salad and will help you prepare one. 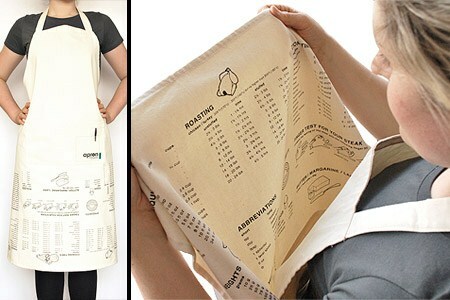 Apron full of useful guides such as numeric conversions, cooking times, freezing instructions, defrosting times, and a cooking glossary. 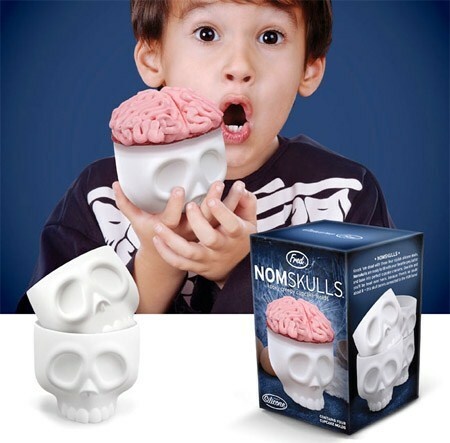 Nomskulls molds allow you to bake perfectly shaped brain cupcakes. 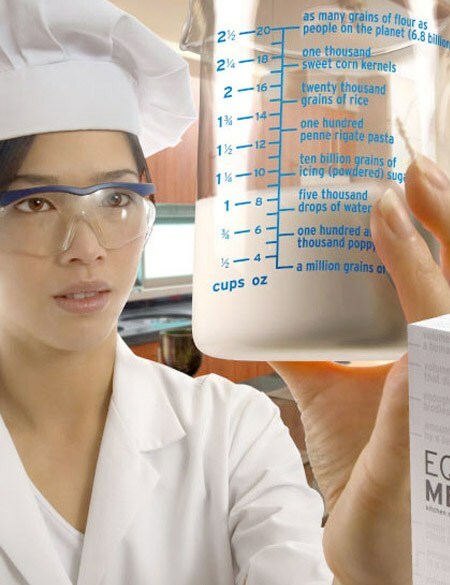 With this unique cup you will see measurements in a whole new light. 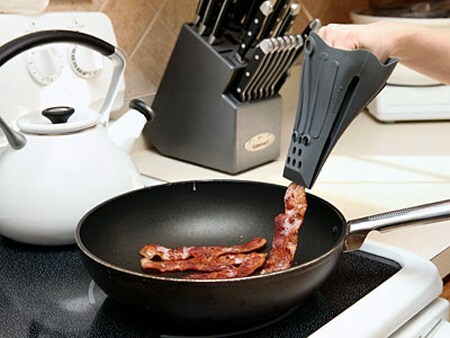 Now you can flip pancakes with an electric guitar shaped spatula. 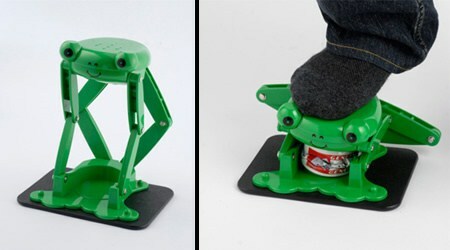 Straight from Japan comes a frog that likes to crush cans. 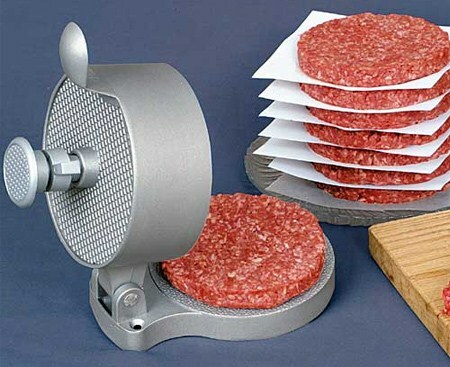 Now you can press out perfect hamburger patties in an instant. 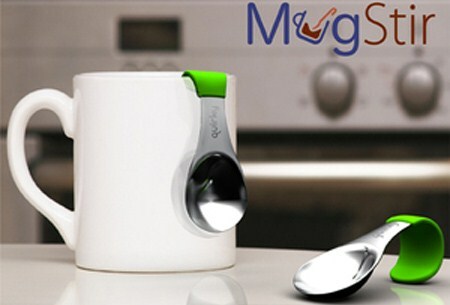 Cool spoon that hangs onto the side of a coffee mug or cup of tea. 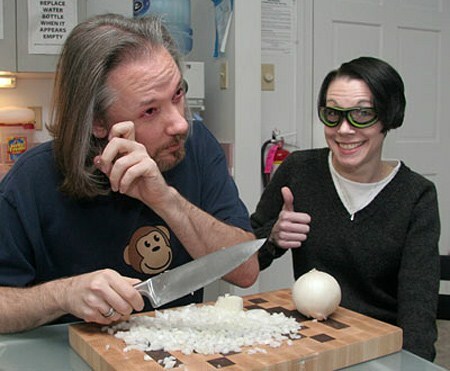 They protect your sensitive eyes from that burning sensation you get when chopping onions. No more tears! 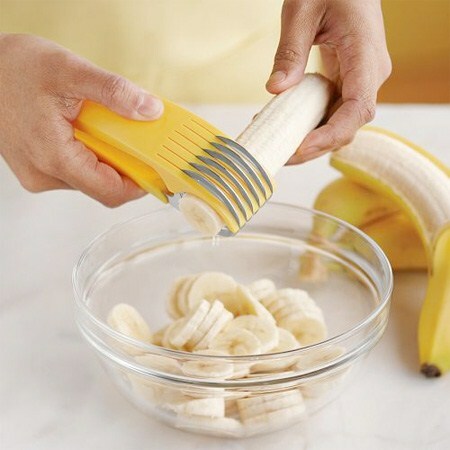 Place the peeler over banana and pierce skin with flat prongs. 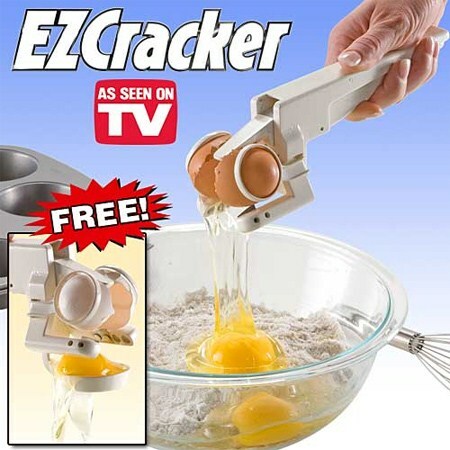 This tool allows you to crack open eggs without any mess. 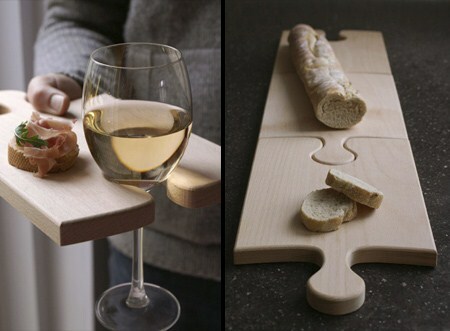 Each board can be used as a cutting board or a serving plate. 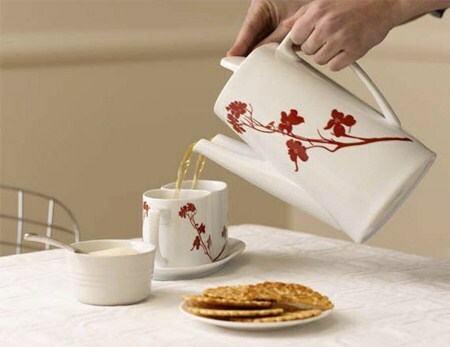 This innovative set includes a double spout teapot, two tea cups with a corresponding pattern, and a single saucer tray for both cups. 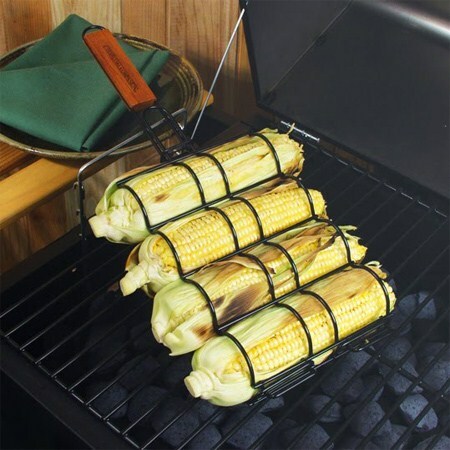 Cool grill basket makes it easy to grill four ears of corn at once. 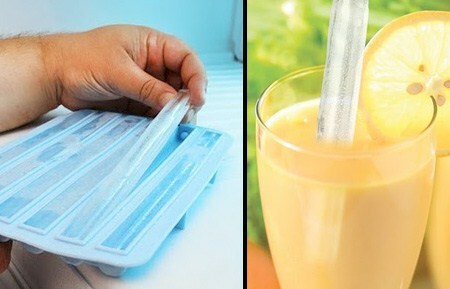 Great for summer parties, frozen straws add fun to any occasion. 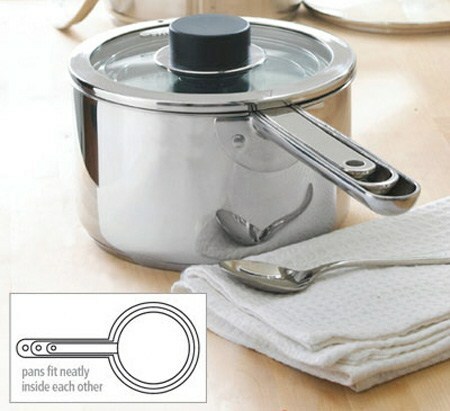 Set of three pans that neatly nest in the space of one, lids and all. Do not wait for a pot of water to boil. 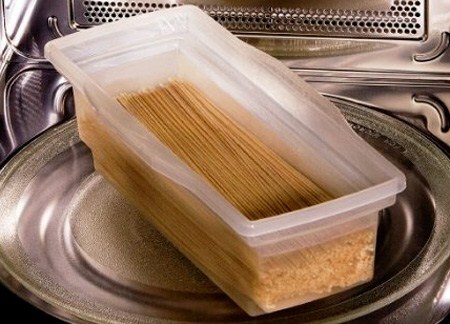 Cook pasta in a microwave. This kitchen gadget will help you crack an egg without the mess. Not only do the cutters increase the surface area, the cut also allows the hot dog to unwind and better fit inside the bun. 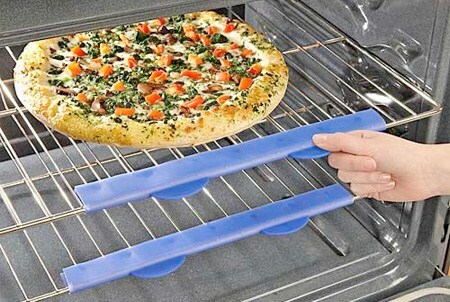 Makes scorching hot oven shelves cool to touch for sliding out without the need for oven mitts. Shredder lets you file down block of cheddar like a real rock star. 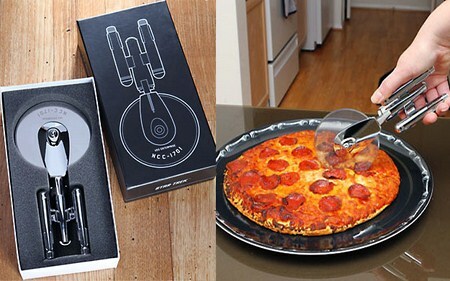 Pizza cutter in the form of the famous Enterprise ship from Star Trek. 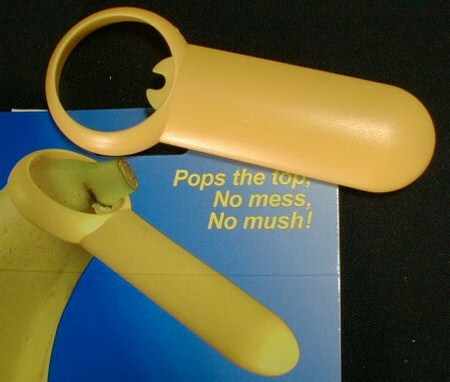 Just squeeze the handle to create five thin, uniform banana slices.